When I first began studying the megalithic monuments of Brittany and the Channel Islands in the 1980s, I noted the coastal distribution of many categories of these monuments, including the passage graves, and confidently assumed that the people who built them, between four and seven thousand years ago, must have depended as much on fishing as on farming. 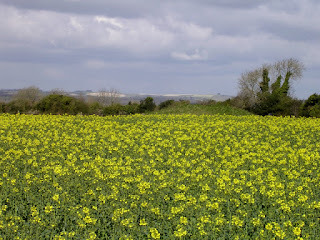 Doubtless they would also have hunted: the modern farmers that I encountered in Brittany certainly did. Since then, however, scientists have developed new techniques, which allow them to reconstruct the diets of prehistoric people based on a chemical analysis of their bones. As result after result was published, the findings were startling: when the Neolithic way of life (cereal cultivation and herding) arrived in western Europe from the east between 5000 and 4000 BC, the people who lived there stopped hunting and fishing altogether, and seemingly within the space of a single generation. How to explain this abrupt transition? Agriculture, after all, is an uncertain business. Crops and domestic animals are vulnerable to drought, floods and disease: why, then, would people who knew perfectly well how to hunt and fish put all their faith in a new and uncertain way of feeding themselves? Religious changes seem to have been taking place at the same time (as evidenced by the sudden appearance of the monuments themselves), so it would have been relatively easy (and lazy) to think in vague terms such as "taboo." Perhaps they avoided seafood and venison for the same reason that Jews and Muslims avoid pork? 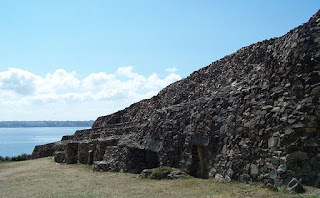 The megalithic cairn of Barnenez, covering eleven passage graves and overlooking the north coast of Brittany. Photo: Farz Brujunet (licensed under CCA). 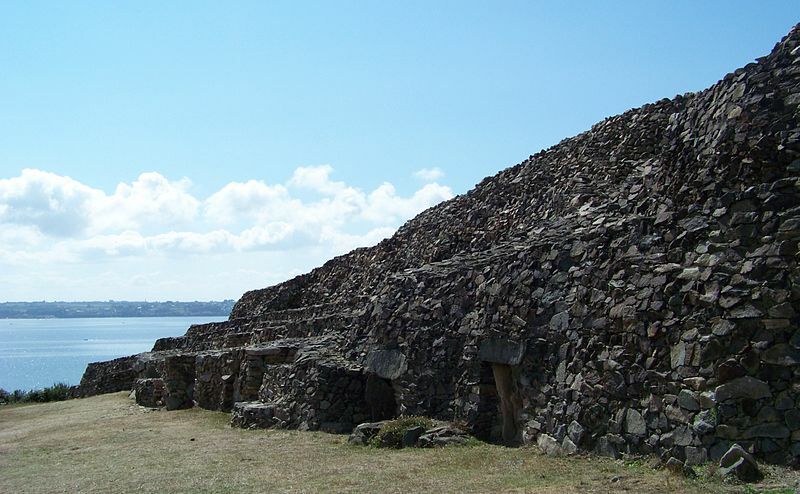 Many of us, however, turned to anthropology for possible explanations. One problem, it seemed, arose from our own mind-set, a mind-set that has developed in Europe over more than two thousand years, and finds its ultimate expression in our 21st Century supermarket culture of packaged foods. It is a mind-set that views the animals whose meat and eggs we eat, whose milk we drink, in purely instrumental terms. It had not, it seemed, been safe to assume that our prehistoric ancestors must have shared this mind-set. After all, not all modern societies do so. 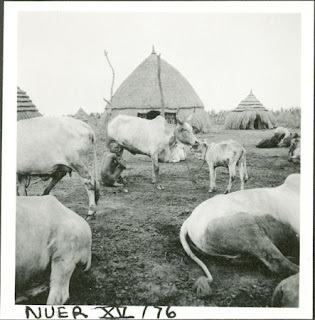 Take the Nuer of Southern Sudan, for example. Anyone who has studied anthropology (including me) knows about them, thanks to the work of the British anthropologist, E.E. Evans-Pritchard (1907-1973). They are primarily a pastoral people, reliant on herds of cattle. They do also grow millet, but they gain most of their protein from the blood and milk of living cattle (they slaughter their cattle only for special events, such as funeral feasts). Their relationship with cows are anything but instrumental. A man's status is defined by the number and quality of the cattle he owns. He sings songs about them, composes poems about them, takes a nick-name based on the colours of his favourite cow. He can recite their genealogies, as well as his own, back through five generations. He guards them at night, walking among them with an iron spear, ringing a bell to reassure them. 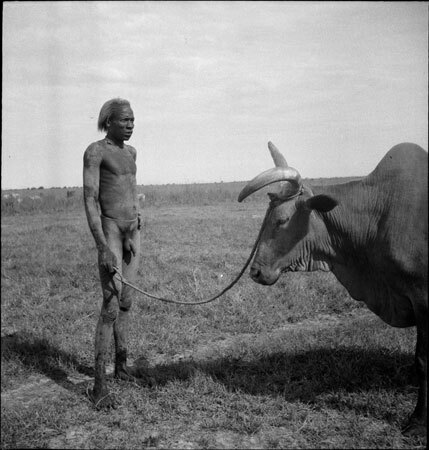 Nuer cattle, and Nuer man with "song-ox." Photos: E.E. Evans-Pritchard (images are in the Public Domain). What he doesn't do is milk them, for that is women's work. Women also stir the curds and make the cheese. There is an eroticised dimension to the relationship between men on the one hand; and women and cows on the other. Nuer girl milking. Photo: E.E.Evans-Pritchard (image is in the Public Domain). This dimension is echoed in cultural traditions elsewhere in the world, notably the Hindu tradition: the Bhaghvad Purana, for example, depicts Lord Krishna courting the gopis (cow-herd girls) of the forest, enchanting cows and gopis, alike, with the music of his flute. 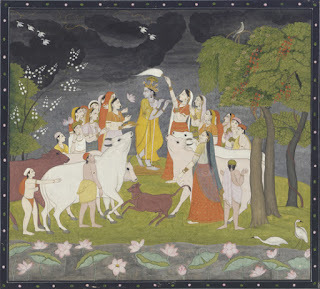 Lord Krishna with gopis, 1790-1800, Smithsonian Institute (image is in the Public Domain). Archaeologists in Britain and Europe began interrogating the evidence for signs that something similar might have been happening among our own Neolithic ancestors, and they found it. Many of the English long-barrows (burial mounds) have been found to contain the bones of cattle, as well as humans: the remains of funeral feasts, perhaps? 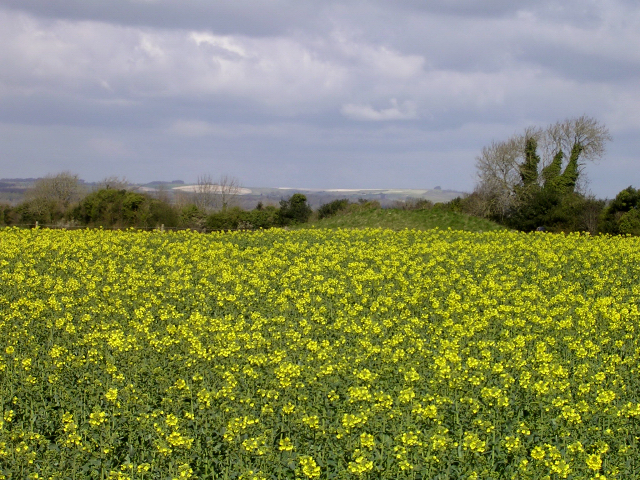 The long-barrow of Thickthorn Down, Wiltshire. 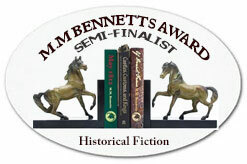 Human bones were found beneath the mound, and cattle bones in the flanking ditches. Photo: Jim Champion (licensed under CCA). One of these long-barrows (Beckhampton, near Avebury) appears to have been exclusively for cattle, with no human remains found at all. "We would propose," wrote archaeologists Keith Ray and Julian Thomas, " ... that a fictive kinship with cattle, both genealogised and metaphorical, was created by these people in the intimacy of their relationships with their herds." This is why, in "The Song of Strangers," the Neolithic story in my novel, Omphalos, the sorceress, Egraste, is the guardian of a sacred bull, as well as the guardian of a shrine (the shrine contains the horns of the bull's supposed ancestors), a sort of Neolithic gopi (though her mind-set and religious beliefs are very different from those of modern Hindus). Only the real threat of starvation will impel her to eat a salmon (stolen from an otter, since she, unlike her ancestors, does not know how to fish), a meal with which I managed, in my youth (though I was no more capable than Egraste of catching one), to delight a number of ladies of my acquaintance.